← This is just the beginning! Just through the grapevine I’ve just heard of a new movie. It’s a wine related movie! Hurrah! It’s called Bottle Shock and is playing in a theater near you! Oh, wait. It isn’t playing anywhere? It was released when?! August?!? And I’m just now hearing about it? Sigh. Well, I guess I’m not part of the demographic for this movie, ironically enough. Or I just don’t pay enough of attention. Of course, I think it’s an independent movie, judging by all of the crested film festival awards listed on the bottom of the projected DVD box design. So will I be reviewing this movie? Not just yet. Looks like I’ll have to wait until February to check this out, unless video stores get it earlier than the rest of us. Or if someone up and decides to play it nearby. I can’t seem to find any record that it ever played here in town. Hm. Anyway, I understand the premise of the movie plenty. In a nutshell it’s about the 1976 Judgement of Paris where some previously unknown wines from California beat out the best French wines in a blind tasting. The action gave a swift metaphorical boot to the metaphorical backside of the worldwide wine industry. It also pissed off a lot of Frenchmen and set Napa Valley on a track of astronomical pricing. It’s also recounted in “Judgement of Paris: California vs. France and The Historic 1976 Paris Tasting That Revolutionized Wine” by George M. Taber, a book that is currently on my “to read” stack. It is also not to be confused with “The Judgement of Paris: The Revolutionary Decade That Gave the World Impressionism” by Ross King. Apparently they judge quite a few things in Paris. I checked out the website and online trailer and, whoa! That’s quite a roster of big name actors for an independent film. The biggest name on the film is Alan Rickman, that British guy I usually refer to as “That British Guy”. If you’re a geek, you can remember him as Alexander Dane from that horrible, yet hilarious flick called Galaxy Quest. Or as Professor Severus Snape in the Harry Potter series, if you’re that kind of geek. Okay, he’s been in a lot of stuff. Next that caught my attention was Eliza Dushku, the sexier-than-Sara-Michelle-Gellar-as-a-vampire-slayer from the Buffy series. Okay, I’m that kind of geek. Whatever. 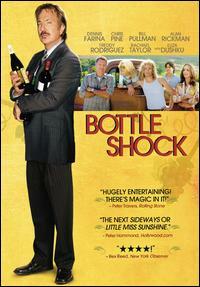 Also starring in Bottle Shock: Bill Pullman! Crap. That’s too bad. And the lineup was looking pretty good up until this point. Don’t get me wrong. He seems like he might be a nice guy and all, and I’m no movie critic, but his acting has always seemed about as interesting as soggy cardboard. If I find a movie where he does a decent job, I’ll let you all know. No. No, don’t even say “Independence Day”. So who knows? Maybe this will be his breakthrough role! So it looks like the movie is out on DVD on February 3rd, just in time for a belated Groundhog Day gift! Or an early Valentines gift . . . Presidents Day is around there sometime too, right? Anyway, it’s just good to see another movie about wine. Maybe everyone can stop talking about Sideways, now. Find the movie website HERE!